Do you have that uncommon weather gene, and did it blossom early? I do have it, it was very early and there is no immunization that would have cured me from it. I was six years old! I grew up in the Southern Plains – Oklahoma, Kanas – and severe weather is a way of life out there. My father was in the military, stationed at Fort Leavenworth. It was late at night while he was writing papers, and a nasty storm came through. I just remember being huddled down on the floor and looking up the hail, wind, rain — the whole gambit. I have always felt that people from the Plains have a greater appreciation of severe weather than anywhere else in the nation. One minute it's a beautiful day; then later on that same day you might have a tornado or a severe thunderstorm. It fascinated me. That fascination must have stayed with you. Even in middle school, I was taking frequent trips to the local TV station — KSWO-TV7, the ABC affiliate in Lawton, Oklahoma. I got to know the meteorologists and on-air personalities there, and that just further enhanced my understanding and appreciation. And yet, you didn't pursue a broadcast meteorology career. I did have some inkling in a sense to do that, but I can't recall to this day why I chose go differently, going the route of science and research rather than the communications and broadcast. Perhaps it was because I have traveled so much that I could not see myself staying in one location. I wanted to get out and see what the world had to offer. I got my Bachelor in Meteorology from the University of Oklahoma, naturally. It was close to home, but also because, as it seemed to me, every time I turned on The Weather Channel, or TLC, or National Geographic, there was always some student or some professor behind some project from the University of Oklahoma. But you're not in Oklahoma anymore. After I graduated with my degree from Oklahoma, I was burned out. The day I graduated, I packed up my pickup truck and drove east and met up with my family in Washington DC. Severe weather is not a common occurrence there, and I started to look more towards the public service. I began working for a non-profit, I fit into the DC environment and its fast pace. Anybody who was anybody worked there. But when Hurricane Isabel came through there in 2003, my interest in meteorology was sparked again. I started working for the Virginia Emergency Management as a storm spotter. I decided that since I went to school to become a meteorologist, I should do something with my life more on par with that. That's when I started to look towards the NOAA Corps. That is not a common choice. No, it is not, and it was one of the hardest choices I had to make. I applied to, and was given the opportunity for, a commission in the Air Force, the Army, and eventually NOAA. I didn't choose the Army because it did not have much of a weather field. I had ambitions to fly with the Air Force, but because of my weather background, they were going to make me a meteorologist. So, NOAA was going to be the best fit. My first assignment was in Charleston, South Carolina, where I worked on NOAA's Premier flag ship – the Ronald H. Brown – an oceanographic research vessel. I did 25 months on the ship. After that, I returned to DC to get my Masters at Troy University. It was one of those things where I just wanted to "check the box". I wasn't sure if I wanted to stay completely with meteorology. My ultimate goal was to become an administrator at some point. So I thought a degree in public administration would be fitting for it. After I got the degree, I went back to Charleston on same ship because I missed it so much. And when the opportunity to come to the storm surge unit at the National Hurricane Center arose, I jumped at it. What do you feel you bring to the unit? The depth of experience that I have is something I can capitalize on, and I think that's why (storm surge team leader) Jamie Rhome brought me on. The one thing I am seeing is that, since we were hand selected, the unit is very cohesive. With the weather background, I don't need the time to be spun up. So I can now quickly tailor my efforts to learning GIS. What is the professional challenge for you? Jamie Rhome has a great talent for pulling the last little bit of talent out of you that you don't think that you have. I think he is modeling me more toward someone who can be in all-encompassing role — a team lead at some point, or step into the role of GIS expert, or take a media call, all very diverse areas. I have to step into some big shoes. 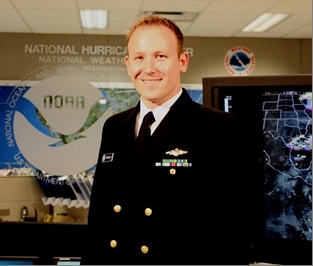 (NOAA Corps Officer) Lieutenant Jeff Pereira has done a great job here, and has developed this role, this job, into something to which I will really have to step up. He's a talented leader and a GIS expert, and I want to be able to meet the expectations the team has for me and take it a step farther. Right now, it's baby steps. I've been here just a few months, trying to learn the job. I'm told I won't have a full grasp until we've gone through a full (hurricane) season. This is a very dynamic job with something new every day. I love the view, we have a window! There are a lot of things I appreciate, but if I were to select just one thing, it's the fact that the storm surge unit is a very young group. So, there is a lot of spark, a lot of excitement, a lot of new ideas thrown out and followed up. It's hard to unwind after being in an operational mode. I am so excited when I come to work every morning, and it's hard in slower times after a storm to bring it back down. I see a lot of that here, and picked up on it immediately when I arrived. When I'm not working, you'll find me spending time with my family. I'll be flying the friendly skies over South Florida – I'm a private pilot – or I am out driving on the road in some of my toys. I graduated high school in Germany, and that's where I developed my love for European automobiles. I will be close to retirement from the NOAA Corps by then, so I'd be looking toward to a career following NOAA. I can't sit still; I have to be proactive and do something. I have considered politics. Being up in DC, working for a non-profit, spending time on the Hill, dialoguing with Senators, Representatives, staffers, it was all very natural and I really enjoyed it. When The Weather Channel is not on, C-SPAN is.